Oldham couplings from Ruland Manufacturing are typically used in motion control applications where zero-backlash performance is required. 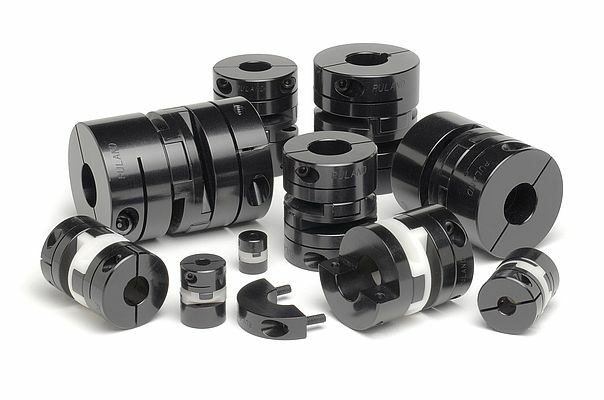 However, these couplings are increasingly used as an alternative to straight jaw couplings on general industrial equipment such as pumps, valves, gearboxes, and conveyor systems due to their versatility, ease of assembly, and extended life if misalignment is present. The coupling is a three-piece assembly comprised of two anodized aluminium hubs and a torque transmitting center disk. This design results in a highly customizable shaft coupling which can easily interchange inch to metric, different bore dimensions, and keyed shafts. The center disc is available in acetal plastic for high torsional stiffness and zero-backlash, or nylon for shock absorption and noise reduction. Ruland offers numerous standard bore combinations from 3 mm (1/8 inch) to 30 mm (1 inch) with hubs also available in stainless steel.